If I can help someone along the way, my living will not be in vain. Don’t have time. Not smart enough. No family support. Don’t have what it takes. Too old. Too young. Timing not right. Too afraid. Might fail. Might succeed. Need help. Can’t afford to. Didn't finish school. Plate too full. Health issues. Others might laugh. Too late. Lack of skills. Retired. Conflicting feelings. Too tired. Just can’t. Not enough. Not good enough. Still stuck in the past. Overwhelmed. Procrastination. Empty nest. Emotionally drained. No motivation. Low energy. Lack of self-confidence. Resists change. Don’t know how. Too hard . . .
Are you living life or merely existing and going with the flow? What excuse is holding you hostage from taking control of your future? Does your negative chatterbox keep you from stepping outside of your comfort zone to do, be, and have what you truly desire in life? Are you waking up dissatisfied with the person that you see in the mirror? Are you a victim, or are you taking responsibility for your life? What is stopping you from achieving your ultimate potential? What vision of “YOU” are you yearning to manifest? How many times have you said next week, next month, next year? If you do nothing different, what is going to be different? What is going to change? Isn’t it time to create the change in your life that you want to see? Don’t you deserve to take a chance to choose to make that change? What might happen if a change in perspective shifted an “I can’t” fixed mindset to an “I can” growth mindset? Are you ready to serve an eviction notice to the excuses that are holding you hostage? Are you ready to stand up for yourself, forge ahead, and create the legacy you want to be remembered for? Are you ready to ignite the magnificence in you? Life is here … It is now … It is simply waiting for you! If all this program did was give you a new perspective and give your self-confidence a booster shot, would it be worth it? If you answered “Yes” to this question, make the decision today to begin the five-week No More Excuses Self-Coaching Program. Program modules are released weekly, giving you the freedom and flexibility to do the work in the comfort of your home and at your own pace. Your online course portal is available to you 24/7 for your convenience and can be accessed wherever there is an internet connection. Content is delivered in audio, video and/or workbook format. Your online course portal also includes optional journaling and discussion features. Please note that this is a self-coaching program and does not include any personal interaction with your coach. Module 1: Do You Really Know You? To be truly happy and fulfilled you need to do more than just achieve your goals. You need to know who you are and be able to authentically express that to the world. Self-confidence and self-awareness only result when your actions are aligned with your values and who you are. Module 2: What is Your Wheel of Life Saying? Physical Environment: Category can be split or changed to Work or Home Environment, etc. Business/Career: Category name can be changed to Motherhood, Work, Volunteering, etc. Finances: Category name can be changed to Money, Financial Security, Financial Wellbeing, etc. Health: Category can be split or changed to Emotional, Physical, Fitness, Spiritual, Wellbeing, etc. Family and Friends: Category can be split into two separate categories. Romance: Category name can be changed to Spouse, Significant Other, Dating, Relationship, Life Partner, etc. Personal Growth: Category can be changed to Learning, Self-Development, Spiritual, etc. Fun & Recreation: Category can be changed to Leisure, etc. Other categories to add could include Security, Service, Leadership, Achievement, Community, etc. You can’t plant a tomato seed, walk away and expect it to magically yield ripe tomatoes, right? What about the growth process of the Chinese bamboo tree in the Far East? After four years of seeing nothing, this tree can grow to a height of 90 feet in just five weeks! A seed only grows and successfully produces the yielded result with consistent nurturing, attention, proper care, and belief in the desired outcome. Likewise, your personal journey from Point A to Point B will require the same; however, if you don’t know where you are going, you will probably end up somewhere else -- maybe going in circles or even becoming stuck. In Week 3, you will transition from a stagnant mindset to a growth mindset perspective empowering you to wake up loving life. You will conquer one of the biggest blockages to success as you begin cultivating a positive and aligned lifestyle yielding the desired results you are seeking. Module 4: What Role Does Gratitude Play? By changing the way we see things, we can change our experience of life itself. In Week 4 you will slow down to take a deeper look at your day, what you can learn from it, and what you are grateful for. Gratitude is the essence of living and loving. Finding appreciation for the simplest things and experiences in life unlocks the pathway to allowing and receiving more. This will be a powerful, enlightening week of practicing daily gratitude challenges. Decide how you will celebrate your win for coming this far in the program. You have done quite of bit of reflection and growth work. The previous excuses and negative chatter are behind you now. It is important to keep at the forefront that nothing is going to take unless you take it. You must be patient with yourself on this journey. The mental seeds that you have planted in the past – whether good or bad, happy or unhappy, pleasant or unpleasant, confidence or apathy – when ripening, they produce the same result and perpetuate the cycle. Progressive growth is a process that requires commitment to continuous nurturing and work. You must not allow anyone or anything to distract, deter, or steal your dream. 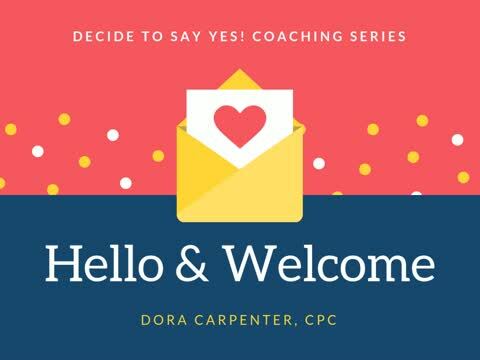 Week 5 culminates with defining what it really means to say “Yes” and you will create your very own personal Yes! Mantra to keep you inspired, encouraged, and motivated. WHAT IS THIS PROGRAM WORTH TO YOU? A sneak peek inside . . . If all this program did was give you a new perspective and give your self-confidence a booster shot, would it be worth it? The cost of the No More Excuses Self-Coaching Program is $247. For a limited time only, Dora Carpenter is offering the program at a $100 discount for a cost of only $147!!!! SIGN ME UP. I AM READY TO EVICT MY EXCUSES. Bonus: Because Dora Carpenter wants you to really, really get rid of your excuses and finally go for what you want, she is including a recording from one of her Feel the Fear® training presentations based on the work of Susan Jeffers, Ph.D. and her book, Feel the Fear and Do It Anyway. This bonus alone is worth more than the cost of the program! Please Note: Dora Carpenter does not imply, offer, or provide professional counseling or therapy.